On GOV.UK we have undertaken a huge project to build a topic taxonomy. You can read about why we are doing this, and our user research strategy for the first topic we tackled, ‘Education’. The ‘Education’ topic gave us lots of ideas for how to do future topics. So last year, we started testing out some of these ideas, to see whether they would help us get to a draft taxonomy faster. To do this, we used card sorting, a well-used method in user research and information architecture. In card sorting, we give participants a set of terms on cards and ask them to sort these cards into categories that make sense to them. This can help the team understand users’ mental models. And make sure we bring user needs into the way we organise content. This is why we changed our approach. We’ve already trialled this new open card sort approach with different topics. Trying these different methods has helped us figure out our 'sweet spot' for card sorting to build taxonomy themes. Should it use all of the content in a theme or a narrow subsection of the content? The ‘Education’ card sort taught us that all of our research activities at the beginning of the taxonomy building process need to be holistic and consider the full breadth of content in the taxonomy. However, our open card sort showed that using a broad set of concepts produces patterns that are too weak to influence the taxonomy creation phase. A closed card sort doesn’t make sense at the beginning of the taxonomy creation process because we don’t have a good idea of categories to suggest to users. However, an open card sort will produce weak patterns, given the breadth of categories that our taxonomy themes cover. Should it be done early in taxonomy creation? We now know that we can only get strong enough patterns with a narrow subset of concepts and a closed card sort. However, we need to be confident about how that narrow subset fits into the whole taxonomy and that our proposed categories are appropriate. Getting to this level of confidence requires time to try out different structures and relationships between concepts, informed by insights from contextual research. For future themes we will wait until we are further into the taxonomy process before we use card sorting to help us make decisions. We will do a series of closed card sorts using categories that have been thought through in the context of the entire taxonomy. We will include concepts for which we have the least user research and knowledge. As a result, the set of concepts will be narrower and produce stronger patterns that we can use to iterate the taxonomy. By integrating this with planned research activities that include interviews and tree testing, we can strengthen our confidence that our final version of the taxonomy is truly user-centred. How have you used card sorting? We’re creating guidance on card sorting for the Service Manual. It would be great to hear how you’ve used the method. Follow Katie and Emma on Twitter and don't forget to sign up for email alerts. Interesting post! I tend to use open card sorts more than closed because, as you say, you can get more rich data about users' language choices and can then use that data, combined with input from subject matter experts to inform your top level labels. After that first round of card sorting, once you have user-informed labels, you could run a closed card sort for additional validation. You could also consider writing short 1 line descriptions of the content for each card rather than using page names or search terms. That might encourage users to think about the key messages of each piece of content and how they relate to other cards. 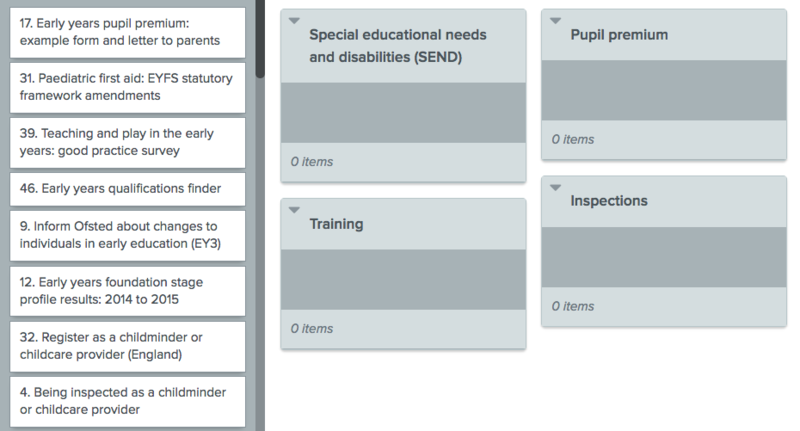 It's also really useful to run a tree test once you have a proposed structure to make sure that users can easily find information and complete key tasks within the new taxonomy. Look forward to hearing how you refine the method to make it work for you! This is very interesting and I wish you luck? When you mention " tree" do you mean as like a family tree. I suppose if you understand the different approaches and experience you/they may make their own ways by the branches? Do GDS know of a cross government membership/subscription for card sorting tools like Optimal Sort? We've been trialling a similar tool and will likely invest. However if there is scope to piggyback and join existing users please post a reply here. How much do the Researchers themselves know about Education? Otherwise are you merely researching methods without content? My own experience and thought dictates content leads from the start.